The 33.8 metre sailing yacht Silvertip, listed for sale by Bjorn Vang-Mathisen and Lars Bjorklund at Ocean Independence, has had a price reduction of €500,000. Designed by Dubois Naval Architects, she was built in GRP and carbon fibre by New Zealand yard Yachting Developments to ABS class and launched in 2001. 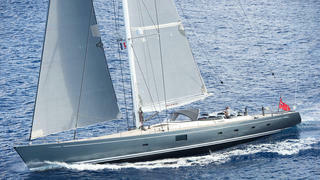 In 2002 she won a ShowBoats Design Award for best sailing yacht under 38 metres. This yacht for sale also won the New Zealand Millennium Cup in 2012, although she was one of the smallest yachts in the fleet. Silvertip has three luxurious and comfortable cabins aft for a maximum number of six guests. There is a splendid master suite, along with a double and a twin, all with en suite facilities. Among the special features of this sloop-rigged yacht is the interior design by Agnes Comar utilising the imported Swedish pear wood that lines the magnificent interior and there is also a new audio/visual system. The large saloon has comfortable seating in the lounge area in front of an entertainment centre including a 46 inch LCD Sony television screen on a rise and fall mechanism. She has been under the same ownership since new and has been immaculately maintained. On the technical side, she has a Southern Spars four spreader main mast, a full wardrobe of North Sails, Harken hydraulic deck winches and a Park Avenue boom. A 300hp Lugger diesel engine gives her an impressive range of 3,500 nautical miles at 10 knots. Located in New Zealand, Silvertip is now asking €4,900,000.